Goodreads description--"I would love you forever, if I only had the chance..."
Kacey isn't one that I would typically connect to. Even when I can intellectually understand how she might have ended up where she has, I don't connect to the character that tries to drown their sorrows in alcohol. Drinking never makes one's problems go away. It only compounds them. And Kacey is no exception. Yet, I can always relate to a character that works to make themselves better. And eventually Kacey does take steps to put herself on a better path. I can respect that. Jonah was easily relatable. (Why does that seem to happen more often than not?) He steps in like a knight in shining armor to rescue Kacey from herself. He offers her what she's so rarely found...a friend who doesn't want anything from her. Sure Jonah finds her attractive, but Jonah has no intentions of beginning a relationship. I could understand and even respect Jonah's desire to keep Kacey at arm's length. Normally, I find characters that self-sacrifice what they want out of some (usually) misguided attempt to protect the other character super annoying because it isn't typically true self-sacrifice. Yet, I wasn't upset with Jonah for trying to keep his distance, and I wasn't upset when that distance was closed. Full Tilt is truly like watching a train wreck in the best kind of way. You know the ending is coming from the beginning. You watch it getting closer and closer, and you can't stop it. But you can't look away either. You brace yourself. And when the impact comes you break apart at the destruction and pain before you. That's exactly how I felt. I couldn't put this book down. I knew how it was going to end. I even made a prediction a good bit before the ending about book 2. Yet I found myself literally holding my breath while reading this book. And when that inevitable ending came, my heart broke. The tears fell. And I don't mean just a few. Wow. The feels. However, one of my pet peeves of the new adult genre was present. I expect physical scenes from this genre, but from about the 50% mark on the scenes were just too frequent for my preferences. And as tends to accompany these scenes and genre, the language was pretty strong and frequent too. Especially the f-bombs. This is something that I've come to expect from the genre, but I don't enjoy it. -"Don't let me vanish, Theo. Please. Help me..."
Full Tilt offered up complex characters with histories meaningful to where they currently are in their lives as well as where they will go in the future. I loved seeing the setup for book 2, All In. And the emotion had me hooked and turning the pages while holding my breath to reach the inevitable heart wrenching conclusion which left me in tears. My few pet peeves of language and sexual content keep me from rating this a full 5 stars. 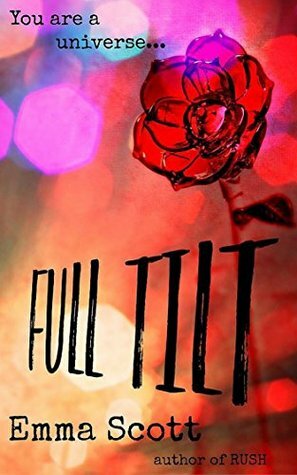 Full Tilt gets 4.5 Stars. Have you read Full Tilt? What did you think? Let me know! Oh boy! I hope I didn't let you down by recommending it! Thanks for stopping by Anna!